The Food and Drug Administration (FDA) approves medicines that have been tested and determined to be safe and effective to treat a specific medical condition. Over 90% of prescription medicines used in adults have FDA approval, but only about 30% of prescription medicines have FDA approval for use in children. This FDA approval, called “pediatric labeling,” is important because it provides information about how doctors should prescribe medicines to children. Some medicines that are safe and effective for adults may not be similarly safe or effective for children. The dose of medicine, how fast the medicine is processed in the body, and side effects of the medicine can be different for children than for adults. Without pediatric labeling, doctors can prescribe medicines for children, using their experience with the medicines or by estimating from adult dosing guides. As more children take prescription medicines for an increasing number of chronic medical conditions, such as asthma and attention deficit hyperactivity disorder (ADHD), the issues of safety and effectiveness in children’s medicines are becoming even more important. 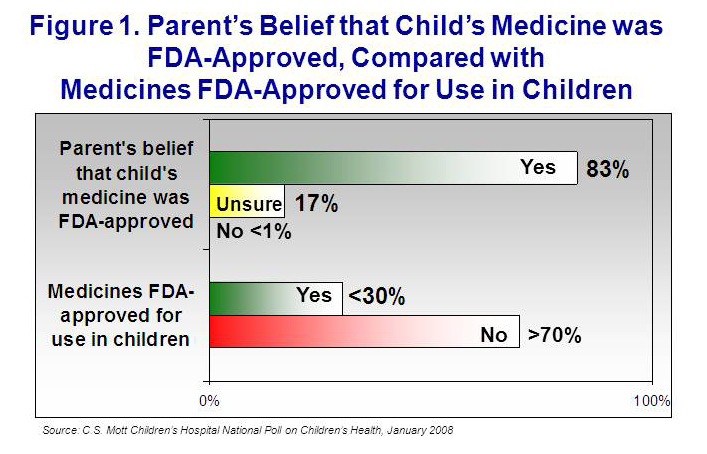 Yet, it is not clear what parents think about the issue of FDA approval of medicines for children. In December 2007, the C.S. Mott Children’s Hospital National Poll on Children’s Health asked parents if they thought the last medicine prescribed by their child’s doctor had FDA approval for children (pediatric labeling). About 5 out of 6 parents believe the last medicine prescribed for their child had FDA approval for use in children, although less than one-third of medicines have pediatric labeling (Figure 1). About 1 out of 6 parents were unsure about whether their child’s last medicine had FDA approval for use in children. 92% of parents wanted their child’s doctor to prescribe only medicines that are approved by the FDA for use in children. Most medicines (95%) used in adults have FDA approval. 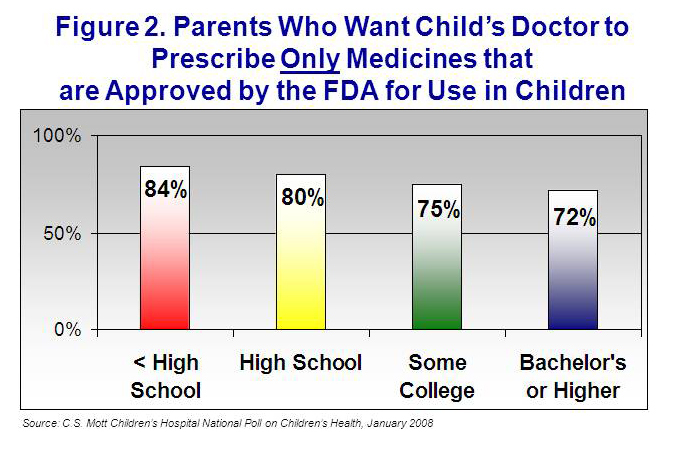 In contrast, most medicines (70%-80%) do not have FDA approval for use in children. 77% of parents still want their child’s doctor to prescribe only medicines that are approved by the FDA for use in children. Women are more likely than men to want their child’s doctor to prescribe medicines only if they are approved by the FDA for use in children. Parents who have children taking medicines for an ongoing health problem are just as likely to want FDA approval than those who do not have children taking such medicines. Parents with less education are more likely than parents with higher education to want their child’s doctor to prescribe only medicines approved by the FDA. 84% of parents with less than a high school education agree that they want their child’s doctor to prescribe medicines only if they are approved by the FDA for use in children, whereas 72% of parents with a bachelor’s degree or higher agree with this statement (Figure 2). Overall, 94% of parents agree that it is the doctor’s responsibility to tell them if their child’s medicine does not have pediatric labeling from the FDA. Parents whose children have no insurance were less likely to agree with this statement compared with parents whose children have private or public insurance (Figure 3). Attitudes about doctor’s responsibility were not different for families of different levels of income or education. 83% of parents believe the last medicine prescribed for their child was FDA-approved, although less than 30% of medicines are FDA-approved for use in children. 77% of parents would like their child’s doctor to prescribe only medicines that are approved by the FDA for use in children. 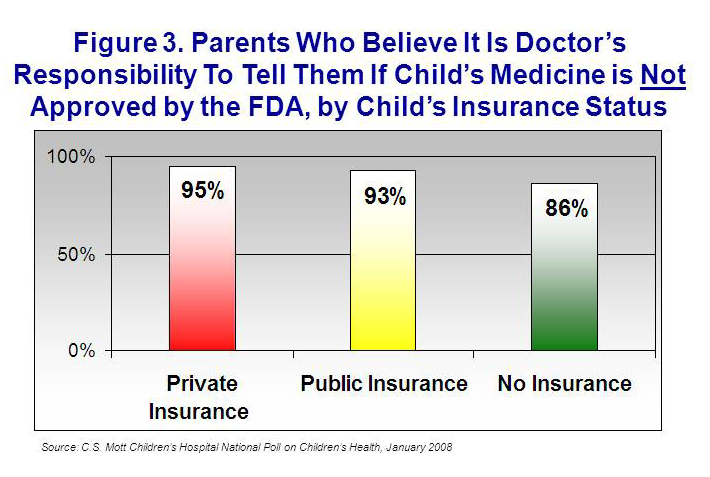 94% of parents believe it is the doctor’s responsibility to tell them if their child’s medicine is not approved by the FDA. Parents with less education are more likely to want only FDA-approved medicines for their children. that have pediatric labeling. The majority of parents also believe their child’s doctor has the responsibility to inform them if prescribed medicine is not FDA-approved for use in children. These findings indicate how important FDA labeling is for parents. Doctors may face several challenges as they respond to parents’ expectations for communication about FDA approval. Most importantly, doctors and parents must consider whether there are FDA-approved alternatives to the medicines without pediatric labeling. Information about pediatric labeling is not always easy to access, and there is very limited information in the public domain. This lack of information is not acceptable, given parents’ emphasis on FDA approval. Second, some commonly used medicines (for example, specific antibiotics and types of steroids) do not have pediatric labeling for all ages or conditions, but are widely used to treat children on the basis of doctors' and patients' experiences. Doctors must be prepared to discuss the reasons behind their choices for medicines that do not have pediatric labeling. Finally, parents' high level of interest about this issue lends support to current efforts to expand research involving children. Fundamentally, FDA approval for a greater number of medicines will require more participation by children in medical research. Parents’ attitudes about research involving children will be the subject of the May 2008 C.S. Mott Children’s Hospital National Poll on Children’s Health Report. Parents: Are your children's Rx meds FDA-approved? This report presents findings from a nationally representative household survey conducted exclusively by Knowledge Networks, Inc, for C.S. Mott Children’s Hospital via a method used in many published studies. The survey was administered from Dec 6, 2007 - Jan 4, 2008, to a randomly selected, stratified group of adults aged 18 and older (n=2,131) with and without children from the Knowledge Networks standing panel that closely resembles the U.S. population. The sample was subsequently weighted to reflect population figures from the Census Bureau. The survey completion rate was 64% among panel members contacted to participate. Davis MM, Yoon EY, Singer DC, Butchart AT, Clark SJ. Ask the doctor: Is my child’s medicine FDA-approved? C.S. Mott Children’s Hospital National Poll on Children’s Health, University of Michigan. Vol 3, Issue 4, April 2008. Available at: http://mottpoll.org/reports-surveys/ask-doctor-my-childs-medicine-fda-approved.